Like braking force, tyre grip plays an essential role in driver and passenger safety. Grip can vary from 1 to 10 depending on tyre type, tread, width, pavement condition and especially weather conditions. 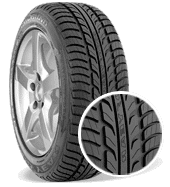 For each of the following three situations, we will explain in a simple, precise way the basic principles governing tyres and their use. 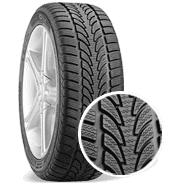 Under such conditions, it is best to use smooth tyres (also called slick tyres) that are as wide as possible so that the treaded area is larger and grip is increased. Advantage : During acceleration or on a curve, the wider tread area will improve grip. The vehicle will stick to the road. Drawback : Significant chassis deformation can occur if the vehicle is not sufficiently rigid. Drivability and acceleration are also reduced because of increased contact with the road, creating friction. 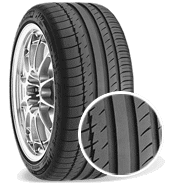 Compromise : Depending on the rigidity of the chassis, look for a compromise between smooth tyres and heavily treaded tyres in order to obtain optimal grip. Adapt your tyre width based on the power of your vehicle. For this type of surface, it is best to be prepared. You will need to keep the grip factor in mind but also consider how the tyre channels water away. Treaded tyres are therefore required. Ideally, tread size is adapted to tyre width. V-shaped tread is recommended. Advantage : Water flows more easily to the tread's outer edge. Drawback: Grip is reduced because the tread area is narrower. Compromise: Depending on how powerful your vehicle is and the size of your tyres, you will have to take your foot off the accelerator on curves and staightaways. In general, the wider your tyres are, the most attentive you'll have to be in heavy rain. As most drivers are not used to driving on snow and ice, it is important to be especially careful in such conditions. In extreme cases, studded tyres or chains may be necessary. For daily winter driving, striped snow tyres are recommended so that the tyres grip the snowy or icy surface as much as possible. Advantage: Winter tyre tread consists of deeper, more numerous grooves, which improves grip on slippery surfaces. This tread is also known as striped tread. Drawback: The overall grip is ten times less than on dry roads. Compromise: When driving on snow/ice, it is important to have a smooth technique (acceleration, breaking, curves) and to use a gear ratio higher than that used for dry weather.